Alton Towers Planning Restrictions – TowersStreet - Your premier Alton Towers guide! Planning at Alton Towers can be a very complex issue. The Resort is located in the Churnet Valley, an area of the Staffordshire Moorlands described as treasured; rich in history and natural beauty. Not an area where you would normally expect to find one of the largest theme parks in Europe. Alton Towers is also located in the Alton and Farley Conservation Area – an area of special architectural and historic interest. There are also two Sites of Biological Importance within the Resort. All of this means that it is far from straight forward when it comes to planning new additions to the park and resort. The aim of this guide is to help you understand the various issues there are with planning at Alton Towers. What is and is not allowed? Where are they allowed to build? With this you should get a better idea of what the future of Alton Towers could look like. It is relevant to bear this statement in mind when looking at the Staffordshire Moorlands Core Strategy and Churnet Valley Masterplan which are both part of the Local Plan. The key theme of the NPPF is that of sustainable development – there should be a presumption in favour of sustainable development. Sustainable development can simply be defined as growth ensuring that better lives for ourselves does not mean worse lives for future generations. At Alton Towers, development that creates jobs, is of good and high quality design and improves the conditions for peopling taking leisure without having a negative impact on the historic landscape could be considered sustainable. If a development is deemed to be sustainable then it should be approved without delay. The full NPPF document is available online at gov.uk, describing what exactly sustainable development is, how it is achieved and also plan-making and decision-taking processes. The Core Strategy is a key plan which influences how and where the Staffordshire Moorlands will develop in the future. It also provides the framework for other Local Plan documents, including the Churnet Valley Masterplan Supplementary Planning Document which is especially relevant to Atlon Towers. When looking at local plans such as this it is important to bear in mind that the NPPF states that they should be produced in collaboration with neighbourhoods, local organisations and businesses so that they reflect a collective vision of sustainable development for the area that is aspirational but realistic. 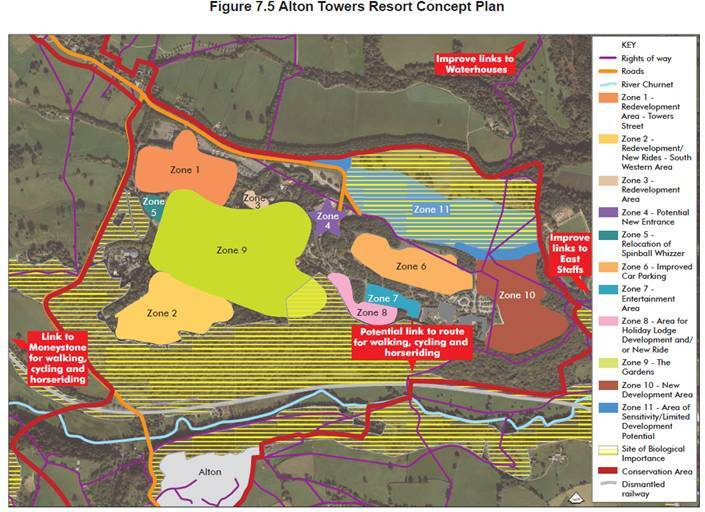 Alton Towers will have been consulted for parts of the plan that do relate to the Resort. What does it mean for Alton Towers? Spatial Aim 3 is of particular relevance to Alton Towers. The Strategy provides strong support for the growth of existing businesses, including Alton Towers as a major employer. It states that providing opportunities for expansion of businesses like Alton Towers is central to the delivery of a thriving economy. 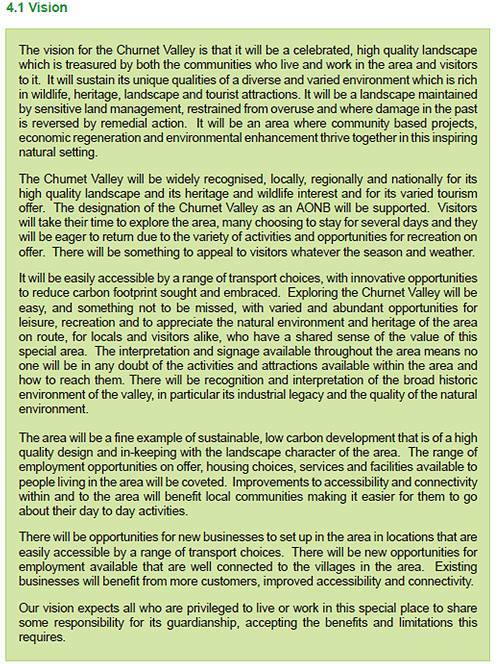 The Strategy promotes the Churnet Valley as an area for sustainable tourism to support rural regeneration. It aims to attract visitors to stay longer and throughout the year. One of the ways this is to be achieved is by “encouraging and supporting the Alton Towers long term strategy to develop their longer stay and ‘family fun’ visitor market”. However, development must not be at the expense of the special qualities of the Staffordshire Moorlands which draw so many people to the area in the first place. This is relevant when it comes to new additions at Alton Towers that are likely to generate increase noise, light or other forms of pollution. It also provides an explanation as to why the initial lodge development at Alton Towers was withdrawn – it would have been a pollution-sensitive scheme (place for people to relax/sleep) adjacent to a polluting development (noise from JCB test facility). This policy ties in with policy SS7 in that tourism development is promoted but must have regard to the spatial strategy of the area. Development at Alton Towers has to sustain, respect or enhance these features of the historic landscape. The Core Strategy and what it contains, including additional policies, is available online at the Staffordshire Moorlands District Council website. 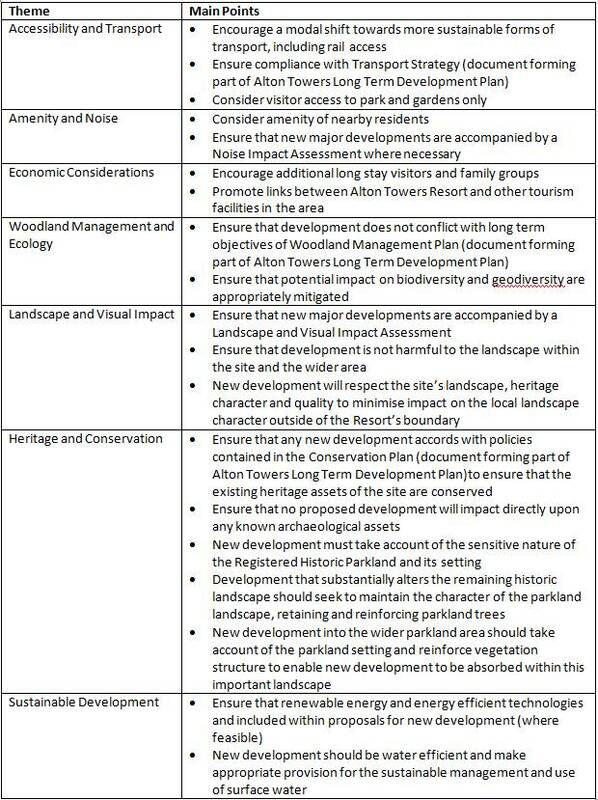 As stated in the Core Strategy, further development at Alton Towers should be considered against guidance set out in this supplementary planning document – the Churnet Valley Masterplan. The Masterplan sets out a vision for the Churnet Valley. It states that it will be a high quality landscape treasured by all those who live and work in it as well as those who visit it. It will sustain its varied environment which is rick in wildlife, heritage, landscape and tourist attractions. Many visitors will choose to stay for several days and be eager to return with there being plenty of opportunity for varied recreational activities. It will be a place for low carbon sustainable developments that are in-keeping with the landscape character of the area. Alton Towers, as a major tourist attraction and employer in the area, clearly has a big part to play in achieving the vision for the Churnet Valley. 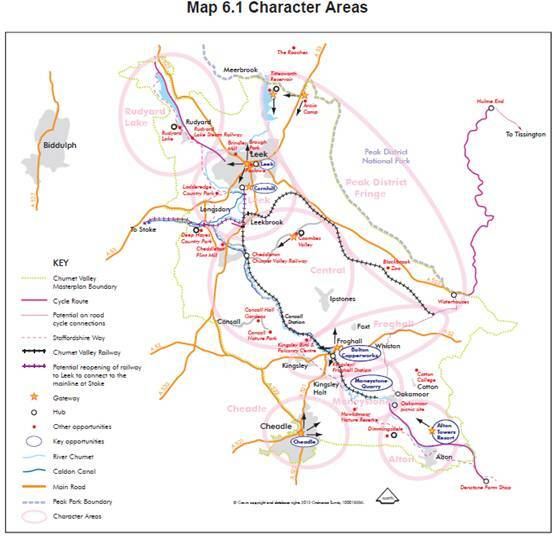 The Masterplan identified eight local character areas, each having different characteristics and differing roles to play in achieving the vision for the Churnet Valley. Alton is one of these character areas, and within this Alton Towers Resort is highlighted as a key opportunity site. As mentioned, a Concept Statement for Alton Towers is provided in the Masterplan. This sets out a development strategy for the Resort as well as numerous development principles. Ultimately this gives us the best idea of what is and is not permitted at Alton Towers and where we may see future rides or other significant developments. 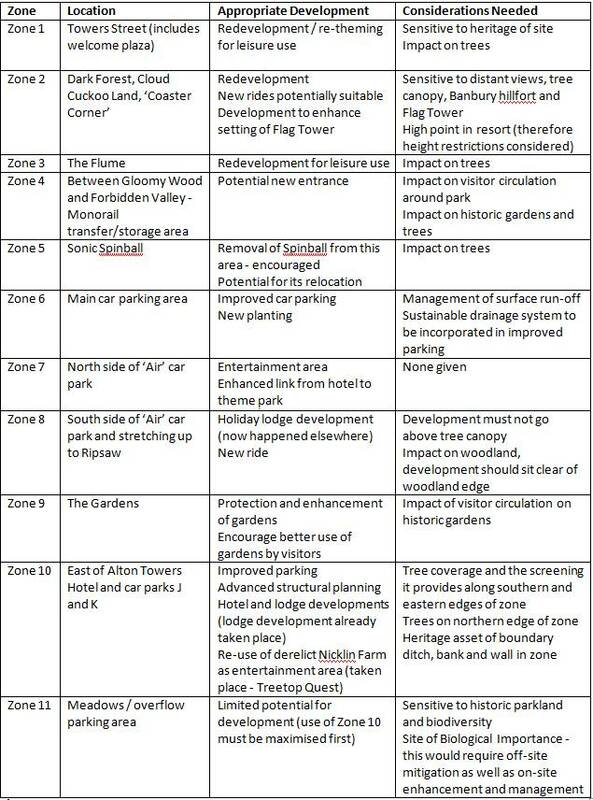 The development strategy in the Concept Statement identifies a number of zones across the Resort and measures that are deemed appropriate within these zones (subject to further details being provided at the time of a planning application). It states that all major development proposals need to consider the impact on views, transport, trees and heritage assets, as well as noise effects for some proposals. The table and map below summarise where these zones are and what is appropriate within them. As well as development in these zones the development strategy encourages continued restoration of the Towers. There is also scope for new appropriate uses of the Towers including visitor interpretation, display of the Alton Towers archive, tourist accommodation, administrative offices and retail use. Of course development is not limited just to what is outlined in the Concept Plan. Proposals beyond its scope will be assessed on their individual merits and in accordance with policy guidance. However it would be fair to say that development proposals in line with the Concept Plan are likely to be accepted by the Council. As well as the development strategy there are a variety of development principles that Alton Towers has to follow when planning new additions. The final development principal states that potential impacts on landscape and biodiversity need to be avoided so far as possible, mitigated and compensated for. 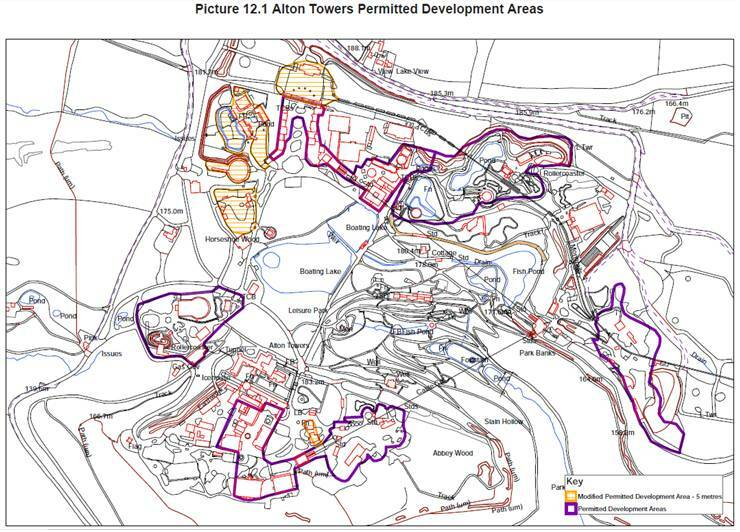 Ultimately new development proposals at Alton Towers will be looked at against the development strategy and development principles, as well as well other principles and policies set out in the Masterplan and Core Strategy. The Churnet Valley Masterplan is available in detail online, on the Staffordshire Moorlands District Council website. When reading about developments at Alton Towers you may have come across the term ‘GDO’, or something similar. They are areas of the theme park when certain development is permitted without needing planning permission. The Town and Country Planning (General Permitted Development) Order 2015 sets out these exceptions where planning permission is not required. Schedule 2, Part 18, Class B defines permitted development at amusement parks. What is and is not allowed in these areas? the extension, alteration or replacement of any existing booths or stalls, plant or machinery so used. in any other case, the height of the building or structure erected, extended, altered or replaced would exceed 5 metres above ground level. In the GPDO an ‘amusement park’ is defined as “an enclosed area of open land, or any part of a seaside pier, which is principally used (other than by way of a temporary use) as a funfair or otherwise for the purposes of providing public entertainment by means of mechanical amusements and sideshows; but, where part only of an enclosed area is commonly so used as a funfair or for such public entertainment, only the part so used is to be regarded as an amusement park”. “Booths or stalls” are said to “include buildings or structures similar to booths or stalls”. To generalise this, in areas of Alton Towers where there are permitted development rights, they are able to build roller coasters and other rides up to a height of 25 meters (82 feet). Buildings and other structures may be erected up to a height of 5 meters (16.4 feet); or in the case of an extension, up to the height of the existing building roof. So where at Alton Towers are these areas? Have these development rights been used in the past? Yes they have. There have been a number of rides built at Alton Towers under the GPDO. These include Sonic Spinball, Rita and Octonauts Rollercoaster Adventure. If it was not for the large station building and theming; The Smiler’s track could have been built without needing any planning permission. However just because development is permitted in these areas does not mean Alton Towers can go ahead and build anything. Spinball was a bad example of how to use these permitted development rights. Although it fitted the criteria at the time (this area of the park was not previously a modified permitted development area) it was a large ride in a sensitive area of the park; close to views across the lake to the historic Towers buildings. The council have and continue to be keen for Alton Towers to remove Spinball and the development rights have been modified accordingly here since. This conservation area was designated in 1971 and can be identified as “an area of special architectural or historic interest the character of which it is desirable to preserve or enhance”. 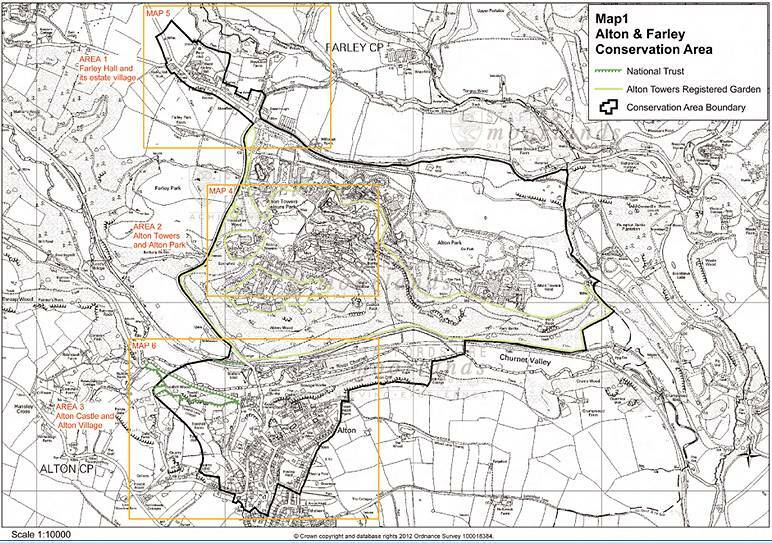 The full Alton and Farley Conservation Area Appraisal gives more detail on the history and character of the area, and can be found online at the Staffordshire Moorlands District Council website. So what happens when Alton Towers want to build a major new ride? Let’s take the example of a major new roller coaster. Alton Towers will first have to come up with a plan; for something such as a major Secret Weapon scale coaster they will often consider a number of potential site locations, designs and themes. Alton Towers, along with their planning partners, will make use of all the policies and guidance available to ensure that their proposal stands a good chance of securing planning permission. Alton Towers will also have to ensure that development proposals fit in with what they have set out in a number of technical studies and reports that form part of the Alton Towers Long Term Development Plan. They are also likely to consult with the council during the design and planning phase and get pre-application advice. This can help clarify what information the council needs as part of the application as well as an opinion of whether planning permission is likely to be granted or not. Then depending on the development other information is also required. For a roller coaster at Alton Towers this could include a Noise Impact Assessment, heritage statement, transport assessment and tree survey. Once the council receive the planning application it is checked over to ensure that all the details are correct and the all necessary documents have been included. When this is done and the application fee has been paid the council will validate the application. At this stage the application becomes public and you can find it on the Staffordshire Moorland District Council’s website. After a short while the council will upload all of the documents associated with the application to the website also. Applications are also publicised in the local press and a site notice is placed where required. Notification letters are sent out to statutory consultees and neighbours. Now that the application is public the consultation stage begins. This is where the public and other bodies, whether they are local organisations or government agencies, are able to comment, object or support the planning application. 21 days from the publicity date are allowed for this in standard applications or 35 days for larger applications. All representations relating to the application are uploaded to the council website for the public to view. They are also used as part of the decision making process. The application is allocated to a case officer from the council’s planning service. The site of the planning application will be visited by the council planning case officer. This will aid any further negotiations or consultations that may need to take place. Once the consultation period has ended a decision on whether to grant the application planning permission can be made. For simple applications the decision can normally be made by the case officer. However more complex applications, which is normally the case for those at Alton Towers, are determined by The Planning Application Committee. The committee meet every 4 weeks and is made up of elected Councillors who listen to the views of the public and consider the report provided by the case officer; this report will contain a recommendation for the decision. Members of the public are also able to speak for and against an application at the committee meetings. Once the decision has been made Alton Towers would be notified. In the case of many applications at Alton Towers, planning permission is granted subject to certain conditions. Conditions may include permitted times of construction, the provision of more detailed information given to the council or measures that must be taken to protect environmental factors. If an application is refused planning permission there is the option to appeal to the Secretary of State. Often when Alton Towers are granted planning permission for a major development they will make an agreement with the council to ensure mitigating investment in other areas. These are made under Section 106 of the Town and Country Planning Act 1990 and known as S106 agreements, or sometimes ‘developer contributions’. The best way to explain these is through use of an example. When The Smiler was granted planning permission in 2012, two S106 agreements were made. The first was a £100,000 transport contribution, requested by the Local Highway Authority, to mitigate the traffic impact from the proposal. The second was an offer from Alton Towers of a £150,000 heritage contribution, spent over three years from the opening of The Smiler on heritage building restoration projects. It was agreed that this money would be targeted to urgent repairs to structures in the Alton Towers gardens. Without these two S106 agreements, The Smiler would have been almost certainly been refused planning permission. Whilst there’s no doubt the myriad of planning rules and regulations cause headaches for the resort, we should remember they’ve also contributed to creating some of the world’s most unique attractions. They’ve helped produce Nemesis and its terrain hugging layout, and Oblivion and its drop plunging metres underground. Without the planning restrictions, these critically acclaimed attractions would look much different to the rides we know and love.